Today, in the 21st Century, it is commonplace to find a computer on a desk in an office. In the late 19th Century, workers did not have the convenience of our modern office equipment. So how did they file papers, write documents, or make copies of documents? This trade catalog is from 1898 and can give us an idea of what office workers would have needed to get their job done. 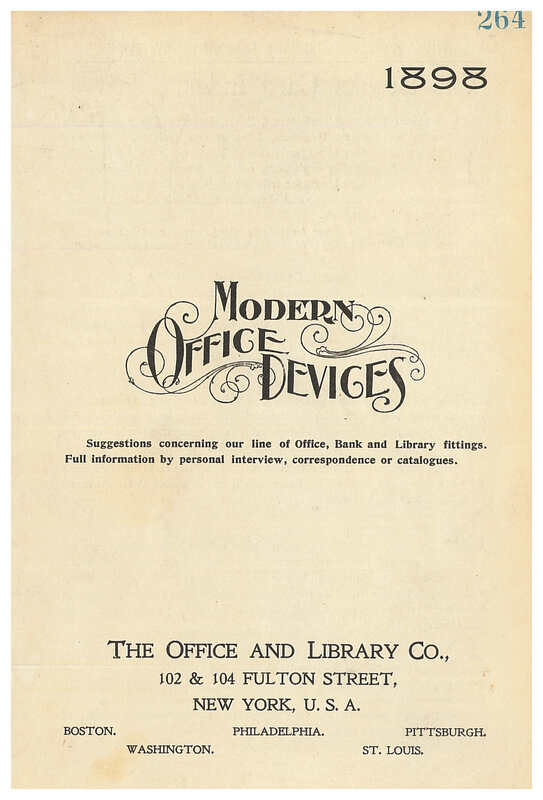 The title of the catalog is Modern Office Devices and the catalog is by Office and Library Co. which sold equipment for offices, banks, and libraries. Office and Library Co., New York, NY. 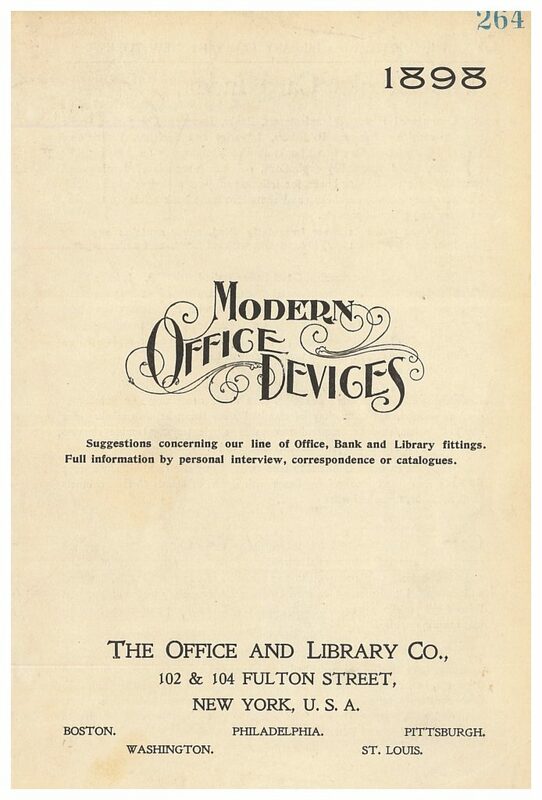 Modern Office Devices, 1898, front cover of catalog. How did people make copies of documents in 1898? They might have used a duplicating device. The Neostyle Duplicating Device could make 1,000 to 2,000 copies from one original document. Illustrated below is a man sitting at the Automatic Neostyle. It was described as “little less than a printing office in itself” with an automatic supply and distribution of ink, automatic impression, and automatic discharge of copies. By closing the duplicating device, it was transformed into a table giving it a dual purpose. Office and Library Co., New York, NY. Modern Office Devices, 1898, page 19, Universal Neostyle Duplicating Device and Automatic Neostyle Duplicating Device. In the workplace, there are always papers to file. That means there must be a filing system. 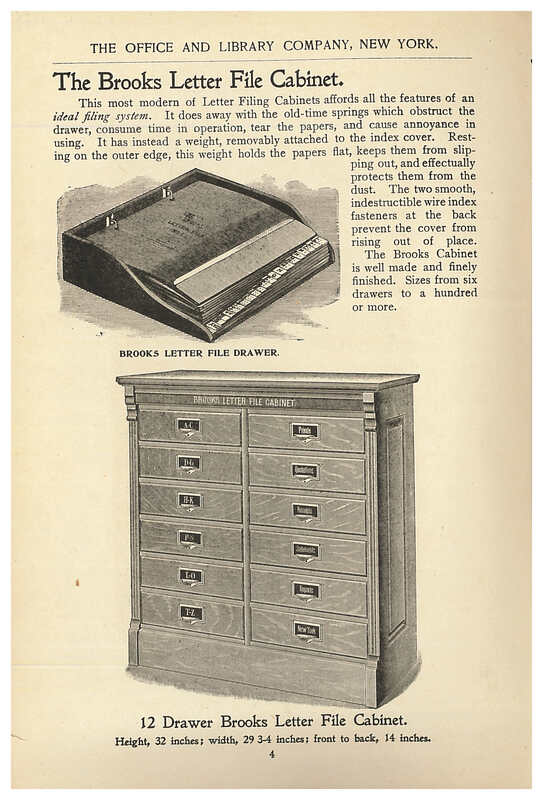 One of the systems described in this catalog is called the Brooks Letter File Cabinet. This file cabinet did not have springs. To protect the papers stored in the cabinet, it had a removable weight which was attached to the cover of the index file. The weight kept the papers flat and prevented them from slipping out of the drawer or being torn or ripped when the drawers were opened and closed. There were also two wire fasteners which kept the cover in place. The Brooks Letter File Cabinet came in several sizes, as small as six drawers or as many as one hundred or more drawers. Office and Library Co., New York, NY. Modern Office Devices, 1898, page 4, Brooks Letter File Cabinet. Office workers in the late 19th Century did not have the convenience of our modern pens. 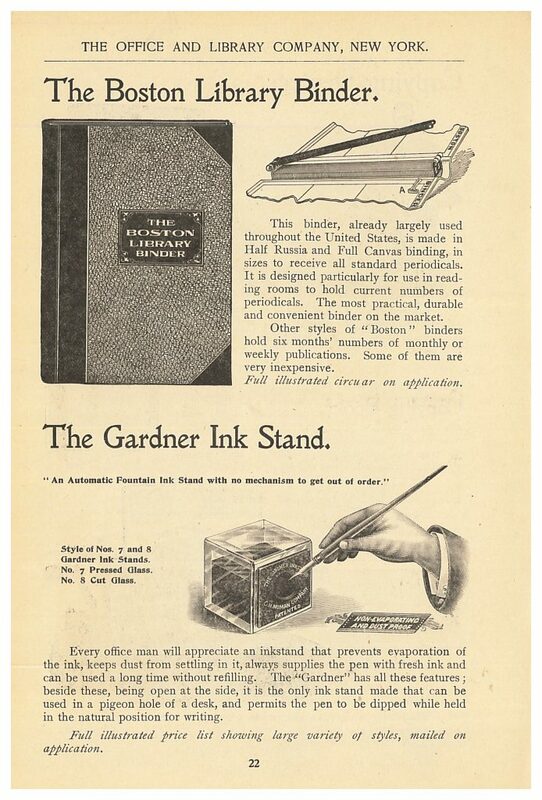 Instead, they might have used an item like the Gardner Ink Stand which is illustrated below. A very convenient feature of this ink stand was that its opening was on the side. This meant the writer could dip the pen while still holding it in the natural writing position. Office and Library Co., New York, NY. 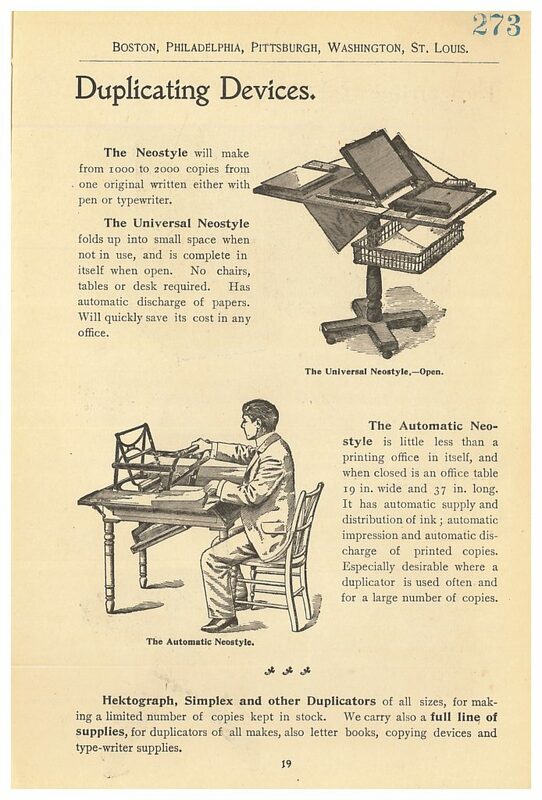 Modern Office Devices, 1898, page 22, Boston Library Binder and Gardner Ink Stand. Office and Library Co. sold other types of equipment as well, including bank and library trucks or carts, office desks and chairs, bookcases, and typewriter cabinets, like the one shown below. Office and Library Co., New York, NY. 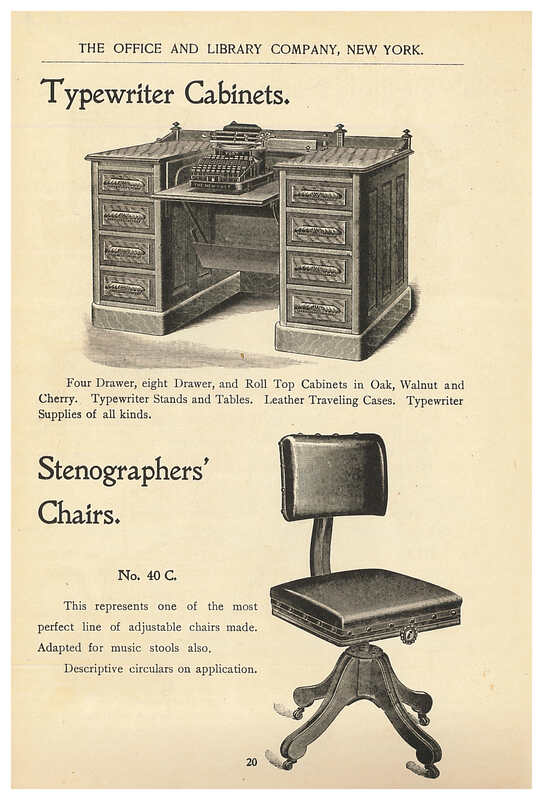 Modern Office Devices, 1898, page 20, typewriter cabinet and stenographers’ chair. Modern Office Devices by Office and Library Co. is located in the Trade Literature Collection at the National Museum of American History Library.